Ladies and gentlemen step right this way. Get your torque, get your angular momentum, get your second law of thermodynamics right here. No waiting. Welcome to this work in progress. Feedback is welcome. Please direct comments, questions, rants or threats to our reader forum or to our resident physics guru, Turbo. Our goal here is to provide a look into the physics of motorcycles that is as accurate as possible while being comprehensible. Everything in this site should be accessible to anyone with a background in introductory physics or, sans that, curiosity. We do not attempt to dot every i and cross every t. If you want the hifalutin, ray gun cachet version, check out Wikipedia - if you can stay awake long enough. For a rowdier interaction check out our WWF style response (warning - R rated!) to select reader comments. Modern motorcycles are capable of 180+ bhp in a rolling chassis that may weigh less than 400 lbs. Because motorcycles are light and powerful (with a large percentage of rotating mass) and have engines and suspensions tuned for cutting-edge performance, they are rich platforms for visceral physics. 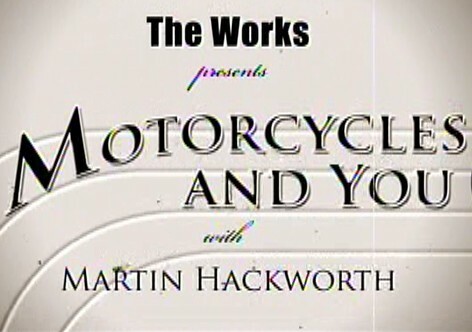 Video courtesy of The History Channel, "The Works"
If you are involved in motorcycle-related incident and would like a data-driven opinion from a qualified expert on vehicle dynamics and accident reconstruction, email me. This presentation is also available as a colloquium for any interested University audience upon request. Photos left and center: Martin Hackworth. For more on how this helmet got this way please check out Visceral Physics 101, aka - Thrills in the Mojave, with your instructor, Martin Hackworth. Properly fitting safety gear is essential for preventing injuries in motorcycle mishaps. Unlike passengers in an automobile, motorcyclists are not automatically (for the most part) protected by restraining systems, systems designed to prevent blunt force trauma and head injuries, systems designed to prevent abrasive injuries or even barriers against the elements. Motorcyclists wear most of those systems in the form of helmets, gloves, boots, leather and/or textile jackets and pants. There is absolutely no evidence for any argument supporting the idea that riding motorcycles without helmets enhances safety. It does not. Helmets must fit properly in order to perform optimally. Helmets are designed to do three things: cushion the brain against impact (traumatic brain injury) during a collision, shield against objects penetrating the cranium in an accident, and prevent abrasion of the face and skull. Although the causes of brain injuries are complex, accelerations as low as the equivalent to just a few g's can produce mild concussions. Any combination of high pre-collision speed and short collision time results in a large value of F (collision force) and hence a large acceleration. Helmets employ layers of cushioning to extend the time interval over which the collision occurs and reduce the acceleration experienced by the brain in collisions. But in order for the cushioning to work as designed the helmet must fit properly (snugly). A loose-fitting helmet results in two collisions during an impact - the second when the head impacts the cushioning in the helmet. Helmets employ a fiberglass, polycarbonate or composite shell to protect against penetration and abrasion. Although harder, stiffer shells (fiberglass) do a better job at this, there is significant evidence that they are less effective at cushioning the brain during an impact. There is no correlation between purchase price and effectiveness at protection among D.O.T. and Snell certified helmets. 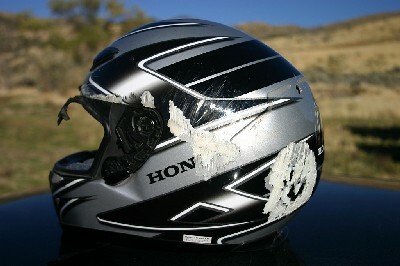 Selecting a helmet with a proper fit is more important for safety than merely obtaining an expensive helmet. Although more expensive helmets often provide superior ventilation, better optics and less noise - all important features - they are not necessarily more protective. Motorcycle protective clothing incorporates padding to cushion against blunt force trauma and an abrasive resistant material with a low coefficient of kinetic friction against asphalt. Leather is generally superior to textiles (especially denim) in terms of abrasion resistance. Textiles are generally more comfortable to wear and more weatherproof. Textile jackets and pants normally have extra padding or hard armor in key areas to increase abrasion protection. 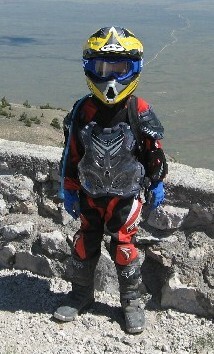 Many motorcyclists wear some form of hard armor or a spine protector either incorporated into their protective clothing or underneath their clothing. Neck braces are also becoming increasingly popular. Top grade motorcycle gloves incorporate leather, carbon fiber, Kevlar and other synthetics to provide protection without a loss of tactile sensitivity. Top grade motorcycle boots incorporate an array of leather and synthetic materials to provide protection, comfort and stability. A spinning wheel, by virtue of its rotational inertia, is stable. The greater the speed of the spinning wheel the greater the stability. Rotational stability is diminished as the wheel speed approaches zero - which is why it is much easier to balance a bicycle or a motorcycle when the wheels are spinning rapidly. 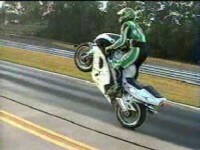 A motorcycle spinning wheel is stable even if it is not in contact with the ground, e.g., wheelies are much easier to control if the front wheel is spinning rapidly when it's in the air (see videos below). A force or torque is required to change the direction, lean or speed of a spinning wheel. A spinning wheel may move forward or backward, side to side, or up and down freely - but a torque is required to change the orientation of the wheel or its rotational speed. Spinning wheels (and crankshafts, sprockets and gears) possess a quantity known as angular momentum (l = mvr) The greater the mass, the radius or the speed of the spinning wheel the greater the angular momentum (and the greater the rotational inertia). The greater the angular momentum, the greater the amount of torque required to initiate a change in direction or lean angle in a spinning wheel. When a torque is applied to a rotating wheel along an axis perpendicular to the rotational axis of the spinning wheel (as in steering a motorcycle or a bicycle) it results in another rotation of the wheel (precession) about an axis perpendicular to both the original rotation and the applied torque. This results in leaning. Gyroscopic effects are influenced by chassis design. Performance motorcycles are engineered to straddle the divide between performance and stability. 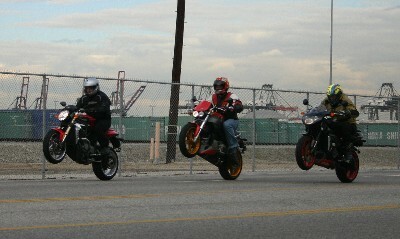 Motorcycles do not steer like cars or tricycles. In order for any inline two-wheel vehicle to turn (at anything above parking lot speeds) it must lean. 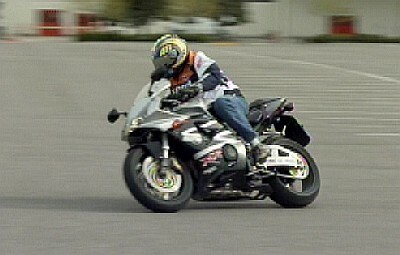 In order for a motorcycle to lean the rider must either shift their body to the inside of the fore-aft axis of the motorcycle or initiate lean via countersteering. Rake and trail are adjustable chassis parameters that affect steering. A combination of rake, trail, wheelbase length, mass distribution, frame geometry, engine mounting, drivetrain configuration and wheel speed determine the mixture of forces involved in turning a motorcycle. In general steeper rake and less trail = quicker steering - but at the expense of straight line stability. Tire profile also affects steering effort and quickness due to camber thrust. "V" shaped tire profiles generally result in quicker steering than "U" shaped tire profiles. For some chassis geometries the torques involved in acceleration and braking produce a strong tendency to stand the motorcycle back up (reduce lean) and oppose direction changes. Countersteering is the act of applying modest input through the handlebars that initiates a direction change in the front wheel but in the opposite direction of the intended turn. The rate at which the front wheel responds to the input from the handlebars in countersteering is controlled by the angular momentum of the front wheel, the moment of inertia of the wheel, forks and handlebars about the steering axis, and by the trail. At high speeds initiating a countersteer requires some muscle. As the front wheel turns away from the centerline of the motorcycle (in the direction opposite of the intended turn) its motion steers the bike into a lean since the front and rear wheels are attempting to travel in different directions (steering kink). The trail allows the center of mass of the bike to be lowered as the wheel is deflected. Camber thrust creates the desired directional change. The gyroscopic precession produced by countersteering supplies the first in a series of "leaning torques" that contribute to lean in the direction of the intended turn. Though the effect is initially small gyroscopic forces do contribute to leaning though they are secondary to the lean induced by the steering kink. A significant percentage of the rotational inertia in a motorcycle is in the rotating crankshaft, camshaft, flywheel and clutch. The gyroscopic effect produced by the steering torque applied to the front wheel may not, in a variety of instances, be enough to rapidly overcome the rotational inertia of the engine and rear wheel completely by itself. As the bike leans over gravity produces an increasing torque on the center of mass of the bike/rider system about a rotational axis parallel to the fore-aft axis of the motorcycle along the ground that accelerates leaning. As the motorcycle's lean increases it produces a torque on the steering axis of the motorcycle, opposite of the countersteer, that causes it to rotate back toward the centerline of the motorcycle - decreasing the wheel steering angle. As the bike continues to increase it's lean the front wheel to swings back through the centerline of the motorcycle and beyond into the direction of the turn. The leaning torques supplied by this wheel motion reverse direction causing slowing the lean of the bike. As the leaning torques and the torque supplied by gravity come to equilibrium the steering angle stabilizes and the motorcycle executes the turn. 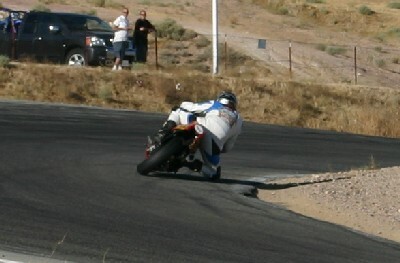 Camber thrust is important in motorcycle turning. Camber thrust is sometimes referred to as the "cone effect" because it roughly describes to the arc followed by a cone rolling on its side. 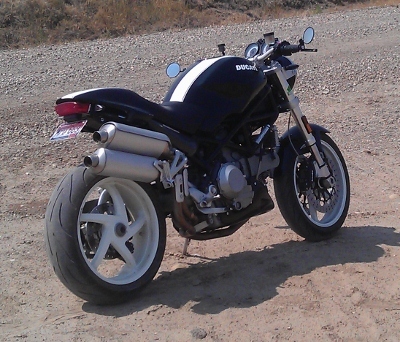 Motorcycle tires must have "U" or "V" shaped profiles unlike automobile tires which are flat. When a motorcycle is moving in a straight line it is vertical with respect to the pavement and its tire contact patch is in the center of the tire at a point farthest from the axis of rotation. When a motorcycle leans, however, it rides on a tire contact patch that is closer to the axis of rotation. Since the parts of the tire farthest from the axis or rotation are moving faster than the tire closer to the axis of rotation the outside edge of the tire contact patch is moving faster than the inside edge. Different chassis geometries, speeds, tires, engine configurations and rider inputs may all affect the exact manner in which a motorcycle is steered through a turn. Various effects compete with each other during motorcycle turning and different effects may dominate depending on the exact conditions. A motorcycle's wheelbase and frame geometry play crucial roles in determining how easily a bike turns. 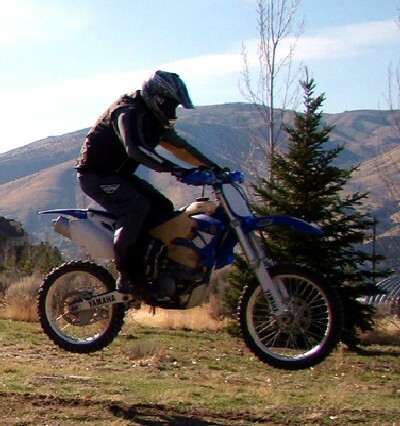 In spite of widespread belief, standing up the footpegs of a dirt bike does not lower the center of gravity of the bike/rider system - it raises it! 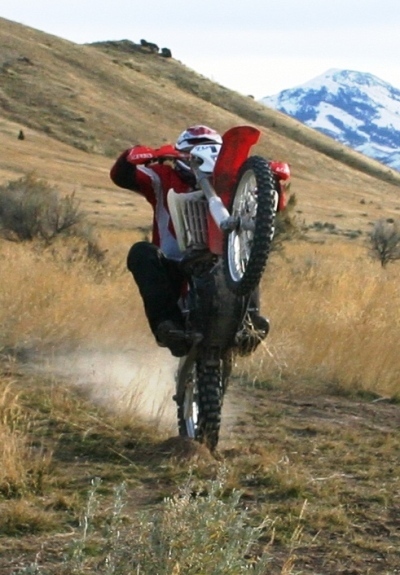 Standing, nonetheless, increases control of a dirt bike in technical terrain for several reasons. Standing optimizes balance, increases leaning torques and minimizes a critical moment of inertia. 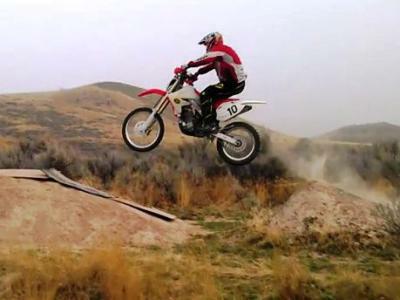 Fore-aft balance is essential to make the suspension work properly on a dirt bike. The standing position optimizes balance, allowing the suspension to function most efficiently. By weighting the inside peg to initiate a turn, one applies a relatively large torque through the pegs about a bike's roll axis (the line between the front and rear tire contact patches). This is a much quicker and more precise way to get a bike to turn than any input through the handlebars. Detaching the bulk of one's mass from the seat produces a much smaller moment of inertia about the roll axis, allowing the increased torque generated through the pegs to more rapidly lean the bike. When a motorcycle leaves a jump and becomes airborne, the only significant force acting on it and the rider (in most circumstances) is gravity. Gravity exerts a force on the center of mass of the motorcycle causing the center of mass to follow a parabolic trajectory through the air. 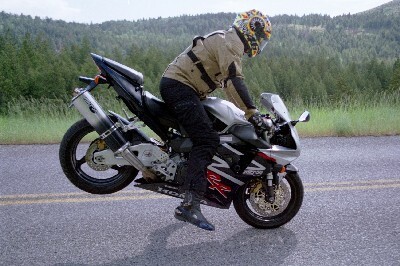 Conservation of angular momentum allows the attitude of an airborne motorcycle to be adjusted by increasing or decreasing wheel spin (with application of the throttle or brakes). 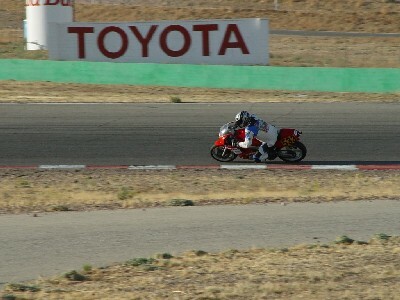 Increasing rear wheel speed with the throttle causes the frame of the bike to rotate backward about the rear axle (raising the front of the bike). This occurs because the torque supplied to the rear wheel via the engine and drivetrain increases the angular momentum of the rear wheel about the rear axle. To compensate the rest of the bike rotates about the rear axle in the opposite direction as the system attempts to conserve angular momentum. Slowing wheel speed causes the frame of the bike to rotate forward (lowering the front of the bike). Though angular momentum is conserved (approximately) with respect to the center of mass of the motorcycle, it is not conserved with respect to the ground. Gravity exerts an unbalanced force on the motorcycle that produces an acceleration of the center of mass toward the ground and a torque on the center of mass about the ground that produces an angular acceleration. The motorcycle's center of mass follows a parabolic trajectory downward. The best takeoff angle for maximum distance is about 45 degrees. Greater takeoff speed = greater distance. Flat landings are almost never desirable. A steep angle that gently transitions to flat is best. 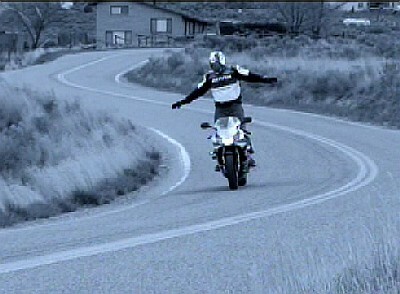 The best attitude for the bike on landing is generally about parallel to the landing. The sensation of weightlessness experienced by a rider in the air is not due to the absence of forces being exerted on the rider and bike. It is, instead, because the downward force of gravity is temporarily unopposed by the upward force normally exerted by the ground (the normal force). This allows a free fall acceleration that produces a novel sensation, since you are not used to it, that gets interpreted as a "weightless" condition. The force of gravity still acts on any falling body (which is why it falls! ), it is just not balanced by the equal and opposite force usually supplied by the ground. Have a look at the video on the right and read about the physics of this jump. Ryan Dudek (of Cycle World) calmly pops one off a flat-top boulder (video courtesy of Jesse Ziegler). Tires, Grip, Cornering - Does Contact Patch Size Correlate with Grip? The size of a motorcycle tire contact patch (a.k.a. - tire footprint) is very small - just a few square inches for each tire. 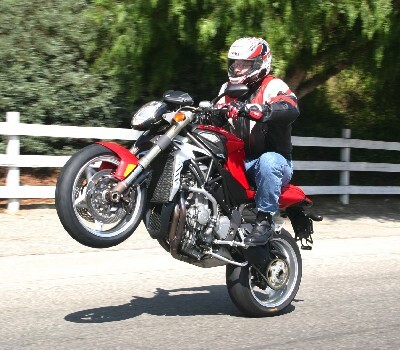 The force of static friction between a non-sliding tire and pavement, the grip, may be expressed as Fs = (µs) x (weight of the motorcycle and rider) - where µs is the coefficient of static friction (about 0.7). Grip is a function of the mechanical and thermal properties of the tire and the riding surface as well as the weight of the motorcycle and rider. Though the size of the contact patch does not correlate with grip in any simple manner, a bigger contact patch may influence the magnitude of the coefficient of friction due to temperature and abrasive effects. A misunderstanding perpetuated by the articles in motorcycle magazines has to do with a direct correlation between contact patch size and grip. The two do not have any simple cause-and-effect relationship. The reason that grip is often greater when the contact patch size is bigger, is because something is pushing down on the tire (typically braking forces) to make the contact patch bigger. This increases the normal force on the tire and the frictional force. If two different contact patch sizes have the same normal force, the force of friction is the same. If you need help believing this, try braking with your rear tire, which has a much bigger contact patch, and see how effective that is. Grip may be compromised by excessive lean, hard braking or acceleration, a slick or loose riding surface, cold temperatures, or any number of other factors. 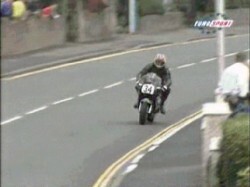 When cornering forces exceed grip a slide occurs. Coefficients of sliding (kinetic) friction are lower than those of static friction - which is why once a vehicle starts sliding, in most circumstances, it is difficult for it to regain traction. It's also difficult to control direction or speed when sliding since grip is lost in all directions at the same time. Once traction is re-established it happens in all directions simultaneously. Depending on how rapidly this occurs there several possible denouements: a controlled slide, a high-side or a low-side. (Videos courtesy of www.head-shake.com). Most racers use slicks - treadless tires which generally have superior grip to DOT street legal tires. Tread does not directly affect a tire's grip (on dry surfaces). Motorcycle race tires are designed around a life of heat cycles rather than wear. Racing is largely about managing traction - and hanging on! For the purposes of this discussion acceleration = speeding up and braking (deceleration) = slowing down. For some chassis geometries aggressive application of throttle or braking yield torques that influence lean in cornering. Trail braking (late braking through corners), or hard acceleration in corners tend to compromise grip at extreme lean angles since the force of friction at the contact patch is required to balance forces from multiple directions. Extreme braking and throttle maneuvers may result in extreme and rapid suspension compression and extension leading to chatter, push, wheel hop and ultimately loss of grip. Both acceleration and braking supply torques that tend to reduce the lean of a turning motorcycle - thus causing it to run wide in turns. Acceleration and braking forces are generally not constant. Gyroscopic stability affects roll, pitch and yaw, but not vertical or lateral displacements of the motorcycle wheels. Suspension systems are designed to return the wheels to some neutral position after being displaced by bumps, depressions or other irregularities. Suspension components include shocks, forks, steering dampers and the rider. Though tires act in some ways as part of the suspension system they are generally considered (along with the wheels) to be part of the unsprung mass of the motorcycle - the portion of the bike not supported by the suspension. The function of springs (or their equivalent) in suspension systems is to force the displaced wheel back to it's original position. 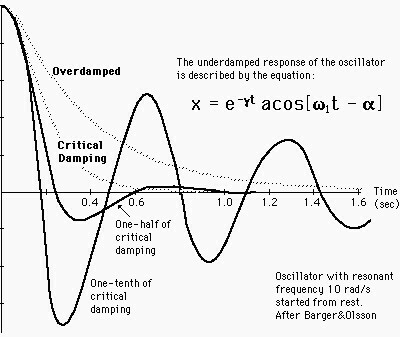 The function of damping is to control the rate at which this return to the nominal position occurs. Forks and shocks are generally sprung with coil springs and damped with oil and/or gas. Motorcycle suspension components are generally adjustable for sag (static height), compression damping (how rapidly the suspension reacts to an input) and rebound damping (how quickly the suspension returns the wheel to it's nominal position). 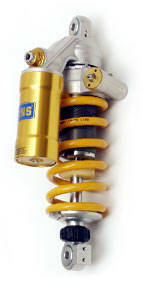 Racing forks and shocks often have separate circuits for high and low speed compression and rebound damping. Precise suspension settings are critical to motorcycle performance. Suspension tuning is one of the most crucial elements in racing. Suspension systems are designed to minimize stiction (which competes with damping effects) and to maximize controlled damping. Damping is accomplished primarily through viscous/hydrodynamic fluid action. 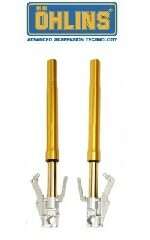 Viscous damping arises from the shearing action of the damping fluid in the shock or fork leg and the resistive force produced is proportional to the speed of the damper movement. 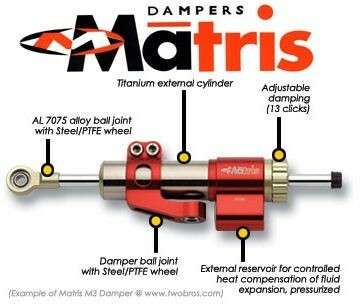 Damping is proportional to the square of the damper velocity and is due to the mass transfer of fluid within the strut. This is obtained by forcing fluid rapidly through an orifice. The damping circuits in motorcycle suspension systems are ideally tuned for critical damping - the fastest return to the neutral attitude of the suspension system without significant overshoot. Steering dampers are fitted to many high performance motorcycles (the are nearly ubiquitous on dirt bikes) to prevent head shake - a high speed oscillation of a motorcycle's front wheel, forks and handlebars about the steering axis initiated when bikes with steep rake, low trail, taut suspensions and very low unsprung mass encounter any situation that causes the front suspension to become momentarily unweighted. Motorcycles are generally powered by thermodynamic heat engines operating on a 4-stroke cycle or, less commonly, a 2-stroke cycle. All thermodynamic heat engines operate most efficiently when the difference in temperature between the hot and cold reservoirs is greatest. In practice this means that the engine must run hot (since the cold reservoir is generally the atmosphere) in order to produce maximum performance. For this reason racing engines are often referred to as "grenades." Most modern motorcycle engines are fuel injected and have computerized engine management systems that allow extensive modifications to be made to the fuel injection and ignition systems via remapping. Many modern engines are oversquare - meaning that their bore dimension exceeds their stroke dimension. This arrangement favors horsepower over torque. Engine displacement = pi (1/2 bore)2 x stroke x number of cylinders. For the Ducati Monster S2R1000 twin (right) this bore and stroke are 94 x 71.5 mm for a displacement of 996 cc. Motorcycle engines contain a relatively significant amount of spinning metal - enough so that engine architecture and positioning may have enormous effect on the handling of a bike. Horsepower is a measure of the amount of power (energy per second) produced by the engine at the crankshaft. Brake horsepower (BHP) is the energy produced at the rear wheel after drivetrain losses, gearbox losses, exhaust system losses, and losses due to the running of ancillary components such as stators, water pumps, oil pumps, etc (on motorcycles anyway). 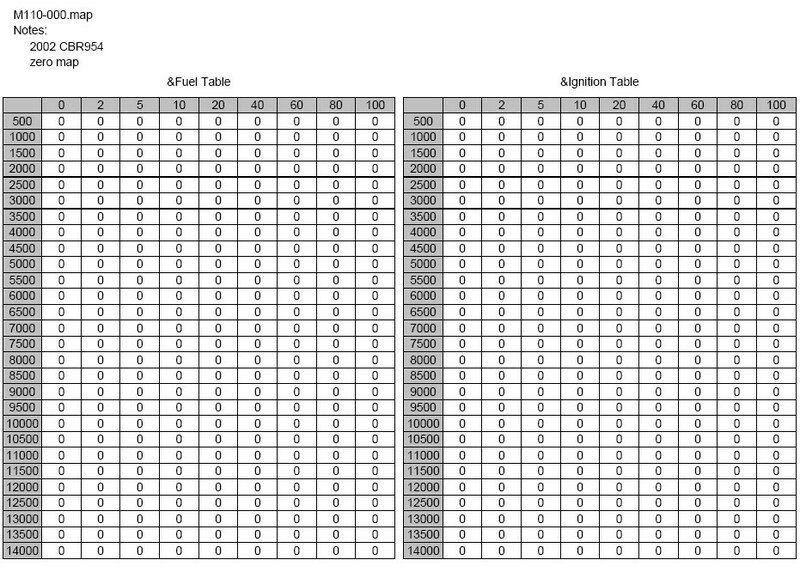 BHP figures are always lower than crankshaft figures. In most advertising (unless stated otherwise) horsepower claims are usually crankshaft figures. In general, the higher the horsepower the faster the motorcycle. Torque is a measure of how much rotational force is being supplied to the rear wheel by the engine, the transmission and the drive train. In order to fully understand the output characteristics of any motorcycle engine both the horsepower and torque curves must be analyzed. Horsepower is (in a relative sense) generally conserved between the engine and rear wheel. Torque, by contrast, is either multiplied or divided. Consider an engine that develops 45 horsepower (33.5 kW) at a given rpm in a gear that produces a 10:1 gear ratio. For a 10:1 gear ratio the torque is multiplied by a factor of 10. If the engine produces 33 ft-lbs (45 Nm) of torque at the crankshaft the transmission multiplies this by a factor of 10 - so that 330 ft-lbs of torque (450 Nm) are supplied to the rear wheel. The ratio changes with each gear. At the same time 45 hp at the crankshaft transmitted through the transmission and drivetrain to the rear wheel (minus losses due to friction and ancillary components). The horsepower remains the same but the output RPM is 1/10 the input RPM. The general formula for determining how engine torque is transferred to the rear wheel is primary drive x gear ratio x final drive x engine torque. 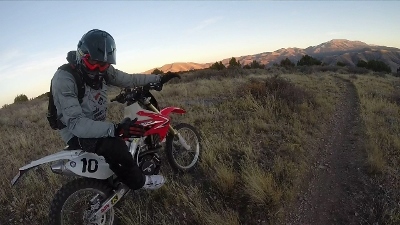 For a Honda CRF450X in in first gear: (45 Nm) x (2.739) x (2.231) x (3.923) = (45 Nm) x 24 = 1079 Nm of torque. Motorcycle engines that develop high torque but low horsepower (many singles and twins) build power down low that drops off quickly at higher RPM. Such engines usually have a broad usable power curve and are easy to manage by virtue of the fact that frequent shifting is not required to transmit usable power to the rear wheel. Motorcycle engines that produce high peak power and low torque (most inline 4's) are higher revving engines that deliver high power but at a narrower (generally high) range of RPMs. Such engines are considered "peaky" and require frequent shifting to maintain usable power to the rear wheel. 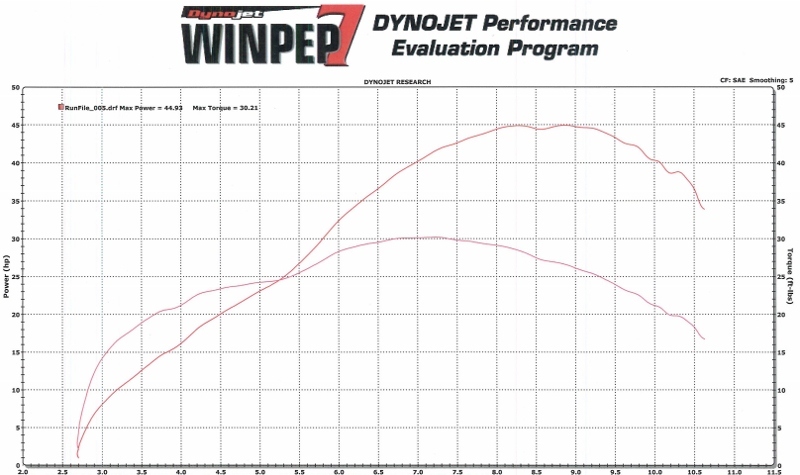 Analyzing peak numbers from dyno runs is easy - just determine where the curves reach their highest point. But this doesn't tell the entire story. Imagine a motorcycle that makes has a very high peak to the horsepower and torque curves but over a very narrow range (a characteristic of many 2-strokes). Such a motorcycle might feel immensely responsive to throttle inputs but only over a very narrow range of engine RPM and would require frequent shifting to keep the engine spinning in the narrow range of RPM required to transmit usable power to the rear wheel. If for a given peak torque you can double the RPM at which the peak torque is delivered you can also double usable engine power. The most powerful bikes then should have the biggest areas under both the torque and horsepower curves and have peak torque that occurs at relatively high RPMs. Most motorcycles are not very well-behaved aerodynamically. Because motorcycles must lean in order to turn there exist design constraints on any motorcycle that is going to be ridden around corners that impact aerodynamic efficiency. 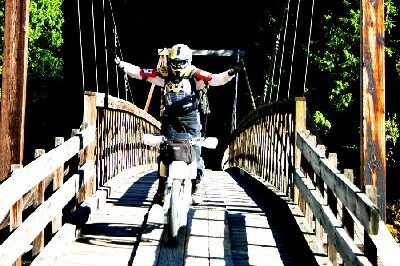 As a motorcycle moves forward through the air it must push the air aside. This requires energy (provided by the engine). The air that flows along the sides of the bike produces friction (aerodynamic drag). Pressure differences (principally between the front and back of the bike) produce forces that act on the bike. Non-laminar flow produces turbulence. At higher speeds the resistive forces build exponentially. 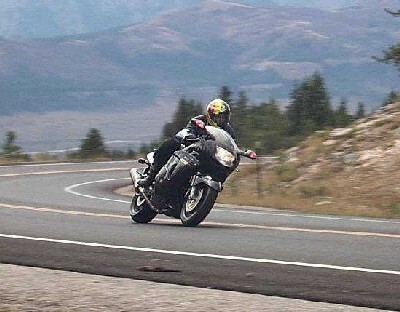 At speeds above 300 km/hr (186 mph) engine power output must increase dramatically to increase speed for most motorcycles. At these speeds greater than 90% of the engine's power is used to counter air resistance. Most motorcycles capable of speeds in excess of 300 km/hr are specially built for straight line speed and are impractical for other purposes. **** a veritable cornucopia of the most noble characteristics to which any website may aspire.